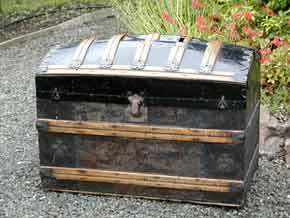 The RunnerDuck Treasure Chest, step by step instructions. Here's a list of materials you'll need to buy. 8" X 1/2" X 60" Maple. I started out by making two rectangular boxes, one for the bottom and one for the top. The bottom is 12" Wide X 7" Deep X 6" High. The top is 12" Wide X 7" Deep X 2 1/2". Dove tail the corners for the top a bottom. I used my handy Rockler Dove Tail jig. 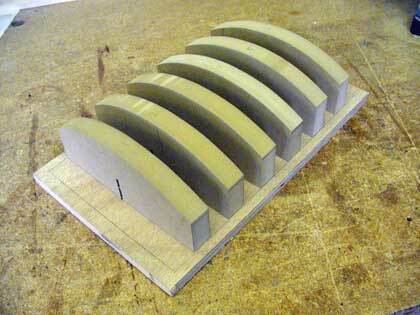 I made six molds for the top from 3/4" MDF. They are 2 1/2" high and 6" wide. I cut and shaped a 6" radius on top of one of them. I traced that shape onto the other five molds and cut just shy of the mark using my band saw. Then I double back taped one piece onto the mold and routed the radius using a Pattern Flush Trim router bit. Cut a 1" slot in the bottom center of each mold piece to help the vacuum penetrate everywhere during the forming process. I used the same mold piece to mark and trim the cover end pieces. First I traced the radius onto the end pieces and cut just shy of the mark. Then I double back taped the end pieces to the mold and routed them flush. Put the ends onto the front and back and mark the extension of the curve onto the front and back pieces. On the table saw cut the marked angle of the front and back. I glued and clamped the top and bottom and let them dry. 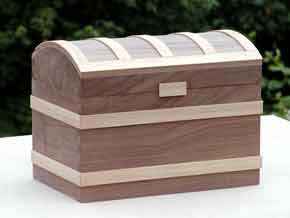 Usually when you build a box you make it complete and separate the top from the bottom by cutting it on the table saw. Because I needed the curved pieces on the end I thought it would be easier to do them separate. 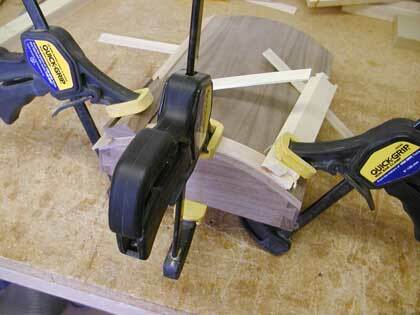 Be careful to make sure that both the top and bottom are perfectly squared when you clamp them. Cut a piece of scrap plywood slightly bigger than the top. Center the top on the plywood and mark the inside edges of the top onto the plywood. Evenly space the molds between the marks and either double back tape them to the plywood or screw them down from the back. Cut six pieces of veneer 6" X 12". 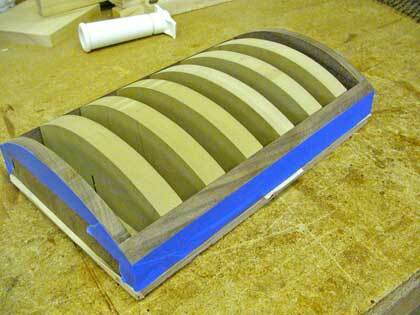 Put tape around the outside edges of the top so that any excess glue will be easier to remove. Now it's time to work fast. If you use a slow drying glue it's better than regular yellow shop glue. 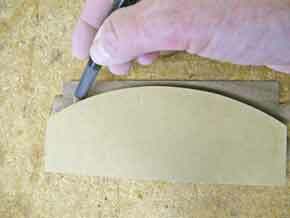 Evenly spread the glue onto a piece of veneer and place another piece on top. Repeat this until you have all six pieces stacked up. 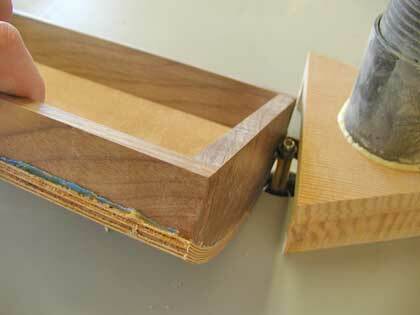 Place the veneer stack on top of the mold and shape it with your hands. I used some large rubber bands to help hold it in place while I placed it into the vacuum bag. 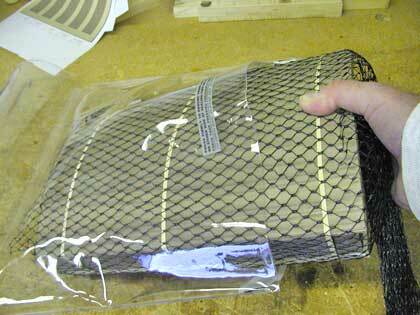 My vacuum bag came with some plastic netting that you put over the item before you pull a vacuum. It helps distribute the vacuum more evenly. Let the assembly sit under vacuum for at least 24 hours. 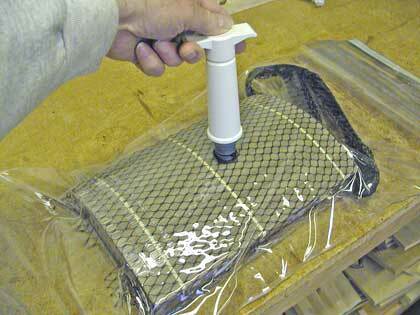 Remove the top from the vacuum bag and clean up any excess glue and tape. I used my band saw to cut the excess material close to the edge of the top. 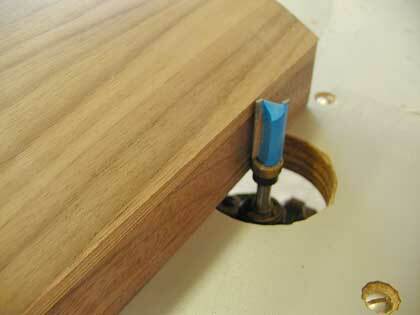 Using a top bearing router bit, flush up the ends of the top. 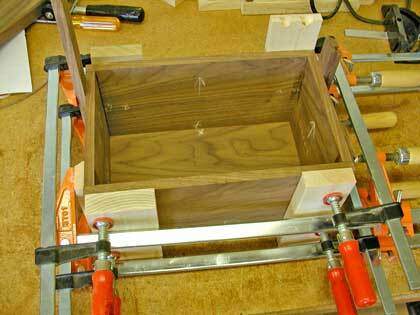 Using a bottom bearing router bit, flush up the front and back of the top. Sand and smooth everything and next we will start decorating our treasure chest. 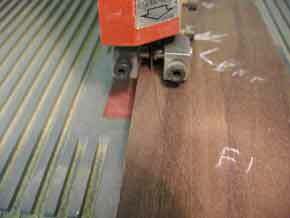 Cut 1/8" thick strips from 3/4" Ash. 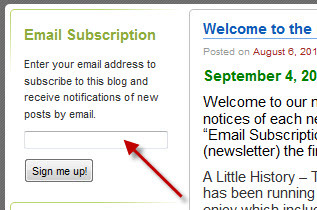 I used a little pusher to make tis task a lot easier. Just screw a small piece of wood onto the end of a 4" wide piece of scrap wood. Let it over hang the edge by about 1/4". 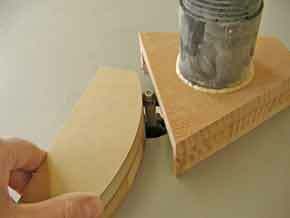 Set your table saw fence so that when you use your pusher you have 1/8" gap from the edge to the saw blade. The slats that run along the front and back of the top need to be radiused along the bottom to fit the curve of the top. 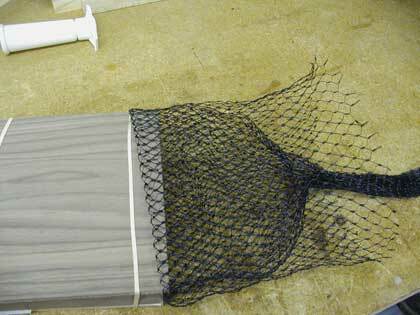 To do this set up your table saw with a temporary fence at an angle across your saw right next to the blade. 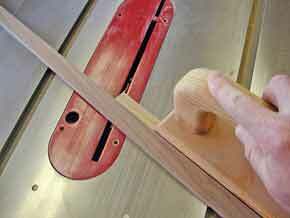 Set the blade to 1/16" high and run the slats across the blade using a flat pusher. Glue and mount one strip along the front edge. Clamp but DO NOT GLUE the other slat along the back edge. 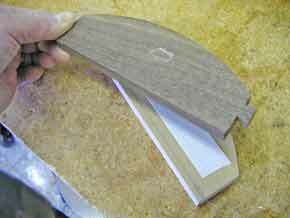 Bend a slat over the top to get the correct length. Cut five slats to this length. 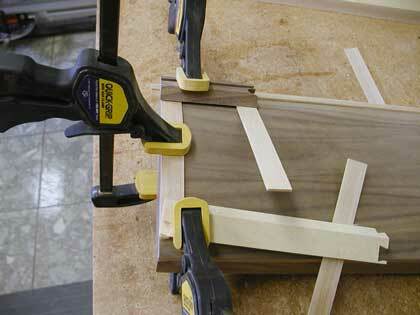 Glue and clamp each slat over the top. 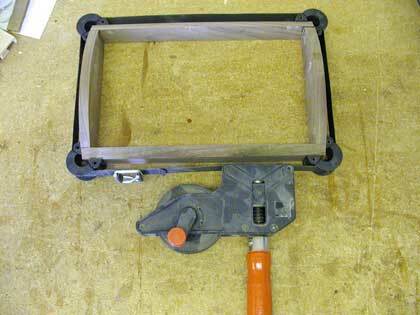 I used the mold pieces with a notch cut in the bottom to help the clamp hold. After you've glued the five slats glue the back edge slat in place. 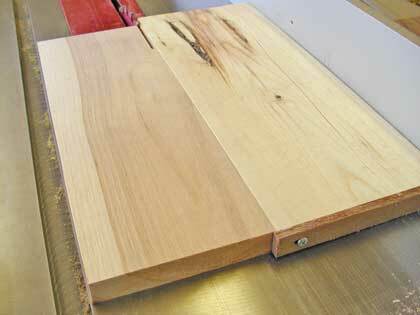 You may want to use a flush router bit to flush the trim strips to the front and back. For the trim on the box cut two strips for the front and back that are 1/4" longer than the box is wide. 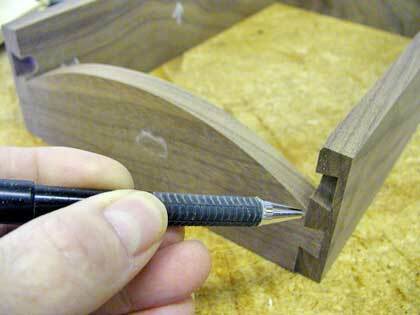 Glue them in place with a 1/8" overhang on each end. Cut and glue the side trim strips to fit. I put a 1 1/2" piece of strip in the center of the front to look like a lock. Install two hinges and finish. You can put felt or even glue in a map in the inside of the box.